Although sunny field tours through towering, leafy poplars are lovely, it’s really after the harvest that AHB poplars earn their keep. Following the harvest of the hybrid poplar demonstration farms at Jefferson, OR and Hayden, ID, GreenWood Resources sent sizable biomass samples to several laboratories for analysis and chemical characterization. Biomass was also delivered to a local biorefinery for a biofuels production test run. Samples were collected from harvests done during both the dormant season (i.e. without leaves) and the growing season. Samples from the dormant season were composed of wood, bark, and coarse and fine branches, whereas the growing season samples also included foliage. The largest shipment was a delivery of 73 green metric tons (fresh, undried biomass), of leafless biomass to ZeaChem’s Boardman biorefinery. The poplar biomass underwent ZeaChem’s pre-treatment, enzymatic hydrolysis, and fermentation processes to produce ethanol. The ethanol was shipped to the Southwest Research Institute in Austin, TX and it has been made into jet fuel. At the same time, ZeaChem, through the company Exelus Inc., converted the poplar ethanol to alkylate, an excellent blending component for gasoline, to run their own production trial of drop-in gasoline. The University of Washington received biomass to test an experimental pre-processing stage in advance of the standard steam pre-treatment, enzymatic hydrolysis, and fermentation stages. 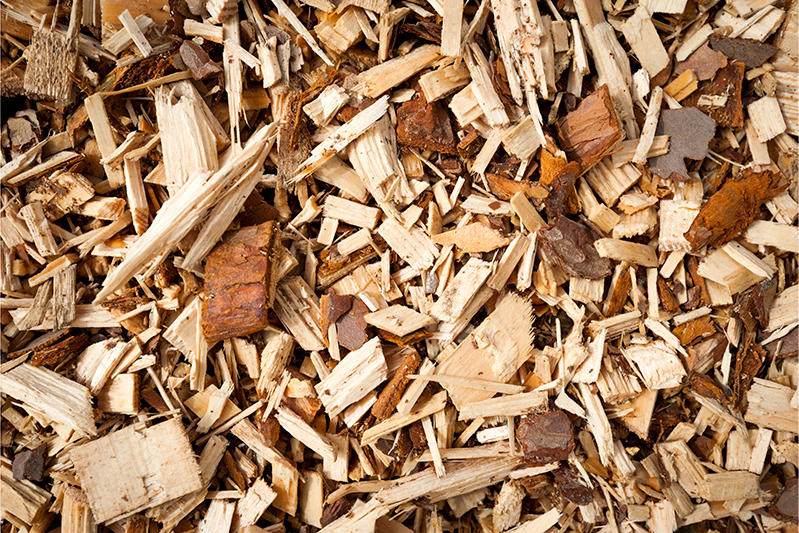 Pre-processing removes the non-structural organic and inorganic components, like ash, from the biomass. Ash appears to hinder the breaking down of the biomass and consequently reduces sugar output. Experimental pre-processing with neutral or acidic washes helped remove ash and other non-structural components and increased sugar yield by 18-22%. Similarly, pre-processing improved the efficiency of the fermentation stage – the yield of ethanol was 36-50% higher for the pre-processed biomass. UW’s economic models estimate that just one pre-processing step will enhance the economics of a biorefinery by increasing its gross ethanol revenue by $43.1 million! Concurrent with the Zeachem and University of Washington shipments, 20 green metric tons were sent to Idaho National Lab (INL) to make poplar pellets. INL processed this shipment to quantify the energy consumption and production costs involved in drying, grinding, separating particles, and densifying the biomass. Furthermore, INL analyzed the physical and chemical properties of the poplar biomass (Table 1). This suite of characterization data is necessary for certifying the quality of poplar feedstock for biofuels production and determining what preprocessing steps might be required to increase the quality of these feedstocks. General specifications for biochemical conversion processes are for feedstocks containing >59% total carbohydrates and for thermochemical conversion process <1% total ash. The composition of the carbohydrate fraction that drives the fermentation process showed that the main six-carbon sugar, glucan, averaged 41.1% of the dry weight of the biomass, while xylan, the main five carbon sugar, averaged 13.8%. Total structural carbohydrates were 58%. Lignin, an important polymer that holds the cell wall together and controls the ease with which sugar is released during pre-treatment and hydrolysis, accounted for 24.91% of the biomass dry weight. The ash content in the compositional analysis averaged 1.1%, while total extractives summed to 8.18%. 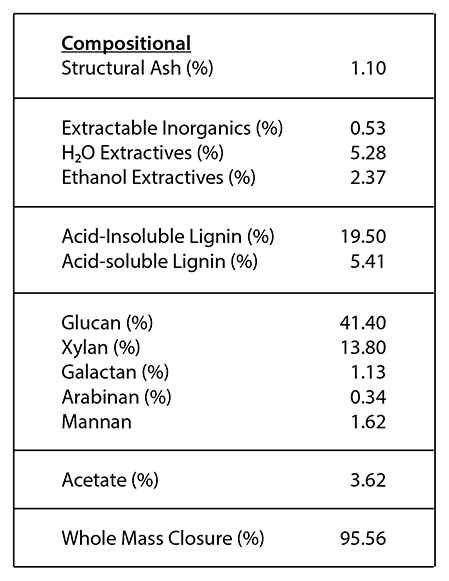 Acetate composed 3.62% of the dry weight of the biomass. In order to create a poplar-based bioeconomy that would operate year round, it is important to know how leaves affect the conversion process. Biomass from the growing-season harvest (leaves on) at the Jefferson farm was sent to Forest Concepts in Auburn, WA for an analysis of the morphological components of the biomass. 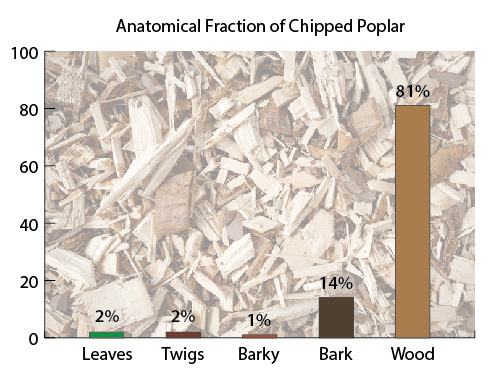 Eighty-one percent (81%) of the biomass was wood, 14% bark, 3% twigs and small pieces of wood-plus-bark, and 2% leaves (figure 1). Figure 1. 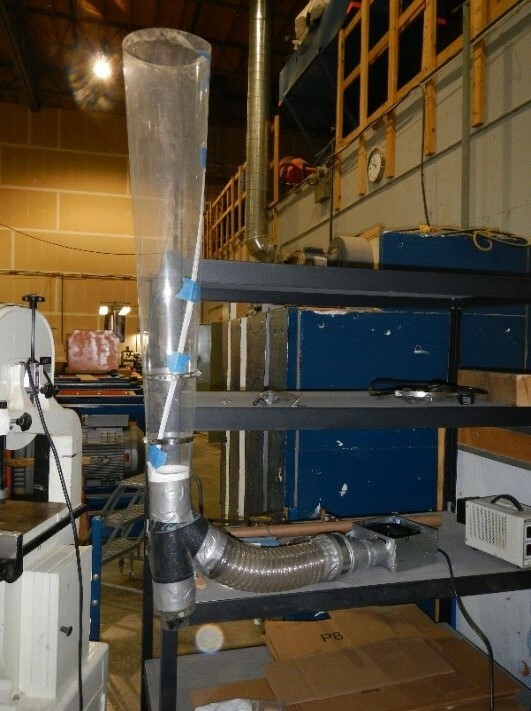 Air classification results for hybrid poplar leaf-on material. Since leaves are not useful chemically for the production of biofuels and biochemicals, Forest Concepts has been experimenting with mechanisms to remove the leaves from the biomass (figure 2). Air separation removed almost all the leaf fragments; small pieces anchored to the leaf stem were all that remained. Figure 2. Forest Concepts’ Leaf Separation Technology: The Air Knife. Wherein might the inhibition lie? Washington State University AHB researchers Jeff Kallestad and John Stark studied the concentration of phenolic glycosides (e.g. salicin, salicorton, tremulacin, HCH-salicortin and salireposide) in poplar foliage that protects them from insect feeding. They found concentrations of these compounds to total as much as 23% of the foliar dry weight in some varieties. They also found significant levels of condensed tannins that impact the digestibility of poplar foliage. If these compounds similarly inhibit the fermentation process, the separation technology at Forest Concepts will be necessary in allowing hybrid poplar farms to be harvested during the summer months for year-round refinery operation. As an added bonus, it may be possible to recover the chemicals from the leaves that are causing the fermentation issues and market them! There is a lot of encouragement for the future of poplar biofuels, as far as the science goes. By experimenting with and analysing the poplar biomass we have a much clearer idea of how to convert it efficiently to biofuels and biochemicals!